I'm not much of a travel sketcher really. And, that's putting it mildly. I would love to have told you that I sat on the street and drew these, but I did it from the comfort of my armchair. Sometimes I long to draw the buildings and landscapes that surround me. But, I don't find it easy. The thing is, when I'm drawing buildings and architecture I aways feel like I'm scratching around trying to find my own style. Up until now, I have never found that. A style that I'm comfortable with. In fact, drawing these little Gaudi buildings - even if it was copying them from a calender - is the closest I've ever come to it. Of course, the other reason for finding drawing architecture so difficult is that I cannot draw in public. Which is a bit of a setback. I liked drawing these buildings, I like the results, I like what my pen has to say. Now, all I have to do is transfer this style to drawing actual REAL buildings. Oh, and conquer decades of acute self consciousness that manifests itself as a shyness that is criminally vulgar. That's all. I love Barcelona, I only went once, briefly but it is forever imprinted...these are as organic as his designs yet have a style of you. I'm so glad that it's not only me that struggles with that. I might have a go at drawing some of my Barcelona photos now. I had the perfect opportunity to sketch in public today, but couldn't bring myself to do it. For me, it's an off-and-on thing, and the less I do it, the more fearful I become. You have such a strong and individual style, whatever the subject and circumstances of the drawing. Always instantly recognizable as AJ. Nice drawings! I keep saying I'm going to go around town and sketch some of the buildings but my shyness keeps me away. I'm gradually trying to work past that though. 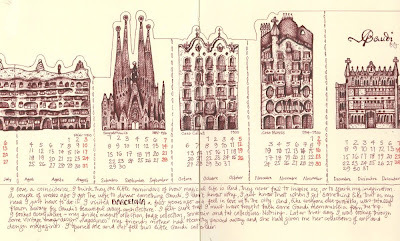 I love your series of Gaudi buildings - please say you'll make a calendar, just like that!! I love Barcelona!! I'm horribly self-conscious about drawing in public. I can whip out my knitting without a second thought because I know that it looks ok...I freeze about the drawing because I never think it looks good enough. Hi, Andrea!! Not only are we both channeling Gaudi . . . we both own this calendar!! I was so excited when I saw that you had begun such beautiful work from the calendar. 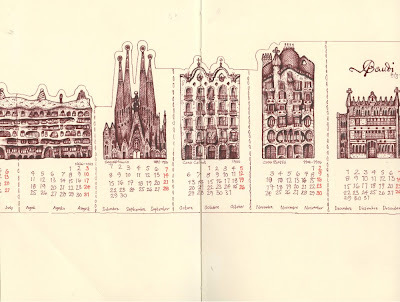 Your drawings of Gaudi architecture are exquisite!! I have many more sketches of Barcelona to do to fill my sketchbook from the trip, but it is a joy to try and decide what to put down as a memory. . . there are so many wonderful ones. I would gladly buy a silver Vespa, a helmet, and an apartment off La Rambla. I hope to go back soon! I like what your pen has to say too! Wonderful work. I'm so glad I'm not the only one! I would love to sit there and not care, but, that would take a whole load of therapy to get to that point. Betty, me too. Me too. As usual, I love the drawings Andrea. I always do. However, in this post I also love the sly Smiths lyrics you snuck in. "I am human and I need to be looooved, just like everybody else does!" This will be in my head for the rest of the day, and that's not a bad thing. Well, Gaudi is perfect for your style!! If only more buildings looked like his maybe you would enjoy drawing buildings more!